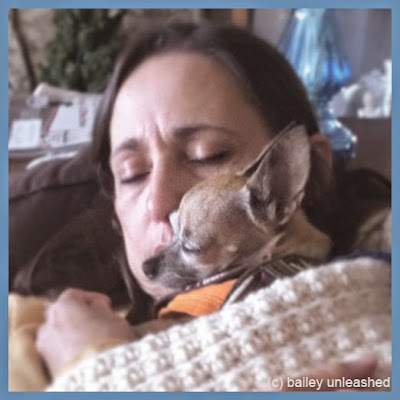 taking care of bailey has gotten easier but it is still a full time job and sometimes i have to recharge with a little siesta in the afternoon. i think if bailey had it her way, we would siesta together on a daily basis. I honestly think we can all use a siesta right about now so Bailey has the right idea. Have a wonderful Christmas and great health in the coming year. That closeness is so good for you! Lowers your heart rate, increases your serotonin levels which helps promote healing. Siesta-on! The healing power of LOVE cannot be overstated. Glad Bailey is recovering and you are recharging. You look so cute cuddling together. Nothing better than a nap with a hot dog lol. It may wear you down, but how fulfilling that you have helped to save her life!